As National Health IT Week comes to a close, let us not forget that this year’s theme – Catalyzing Change – applies to advancing women in health IT as well as the next big innovation in care delivery. 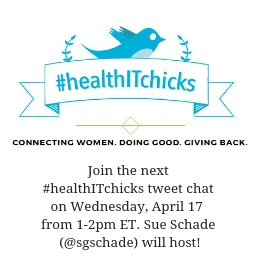 We put a call out to members of the #healthITchicks community, asking for examples of how they have seen individuals and organizations be the change when it comes to advancing opportunities for women in health IT. Take a moment to read these stories and reflect on how you and your organization can catalyze the change you wish to see for women in the world of health IT. In the decade that I’ve been in healthcare IT, I’ve seen the gender gap narrow slightly, though we still have a lot of ground to cover. I’m proud to say WebPT is founded, led and funded by women. In fact, we are very passionate about advancing women in health IT and providing opportunities for mentorship — so much so that in 2014 we launched PropelHer, an internal group that fosters open and honest discussion about professional development, personal growth, and women’s empowerment. In fact, other organizations — such as Rockhurst University — have since adopted their own versions of PropelHer to encourage leadership development for aspiring PTs. I am also inspired by leaders like Sharon Dunn, PT who have a steadfast commitment to advocating for diverse leadership representation within the rehab therapy industry. Sharon also encourages innovation and technology adoption, and recognizes the need to embrace health IT for the future success of the rehab therapy industry. For me, the person who comes to mind is Sue Schade. In an era where many people are overly cautious with what they say, she’s a breath of fresh air. Whether it’s through her blog or by speaking at events like HIMSS, Sue doesn’t hesitate to speak out about what needs to change in order to advance more women to leadership roles. She speaks candidly about her own experiences, and offers helpful advice to others. We could use a few more Sues! Emma Brandon, RN, Associate VP of Ambulatory, Clinical Systems, Informatics, and Population Health at Mount Sinai Medical Center Miami Beach. With 40 years of healthcare experience, Emma started as a nurse before moving into nursing administration and then clinical systems. Candice Friestad, RN, Director of Clinical Informatics at Avera Health and our Voalte Innovator of the Year Award winner. Candice has 39 years of experience, also starting as a nurse before moving into IS and informatics. As part of my interview for our award, I was pleased to hear from some of the younger people on the Avera staff who clearly look to Candice as a mentor. Kristi Henderson, VP of Patient Access and Healthcare Transformation at Ascension, delivered the keynote address to start the second day of our conference. Her forward-looking presentation on the future of integrated healthcare and her past experience blazing trails in telehealth was inspiring. Carol Steltenkamp, MD, Chief Medical Information Officer at UK HealthCare, is a practicing professor of pediatrics and on the front line of EHR implementation throughout Kentucky. She recently was named one of the 75 Most Powerful Women in Health IT by Health Data Management. Dr. Steltenkamp was joined on stage by Christina Bevevino, Client Technology Engineer at UK HealthCare, who has 20 years of IT experience in various industries. Thanks for asking me to share my thoughts. Voalte customers – many very accomplished women among them – are doing some amazing things in HIT! I’m really excited about this week because we had a meeting with several female leaders about promoting better education and connection for women in Utah. This week has been really great for Utah and health IT. I had lunch with Camille Wickler, the president of Utah HIMSS and an employee of Microsoft; Teresa Rivera, president and CEO of UHIN; and Holly Rimmasch of Health Catalyst. We met and talked about how we can promote getting more women involved in STEM in Utah. Health Catalyst just sponsored a scholarship for women to go to school to learn code in Utah. We wanted to connect more with a mentoring program in Utah. They also talked about the challenge of recruiting women and getting more job applications for women in healthcare IT. There is a dearth of applicants. Getting the really talented people in code involved in healthcare is a challenge. The ideas of having a mentorship or partnering with local school districts and colleges, as well as existing women’s groups, might be the next step for this core group of women at HIMSS in Utah. We want to partner with the national HIMSS team and make sure that there are more opportunities for women coming back to the workforce or entering this industry. Educational opportunities need to match the life needs of all women. This might mean that a single mother with little experience can’t find childcare while pursuing education in STEM. One of the best ideas from the group was to make sure women are educated about the differences in compensation about positions. Having better insight about expected wages and opportunity directing our education and professional development will give women more opportunities. I am really excited about the opportunities for women in technology in Utah.